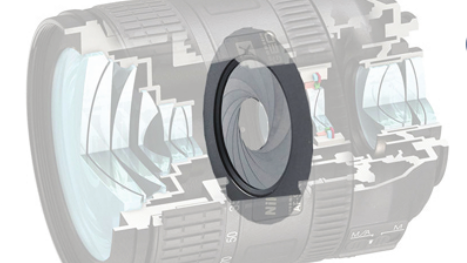 In most cameras, the Aperture is a mechanical array of fan-like blades with a hole in the center. The blades can be manipulated to make the hole larger or smaller. When the hole is smaller, less light is able to travel through the lens to the imager, such as when shooting outside on a bright sunny day. When the hole is increased in size, more light is allowed to travel through the Aperture inside the lens allowing the camera to "see better" in darker conditions such as interiors or night time shooting. The Aperture is universally described, discussed and used in practice by a set of very specific numbers in sequence. This sequence is a scale of logarithmic numbers that alternately double in value as the scale increases. The values in this scale are referred to as "F-Stop" numbers and these "f-stops" are listed on the lens, in the digital menus of certain cameras and is the basis of light meter readings as well. The most used portion of the "f-stop" scale is as follows: f-1.4, f-2, f-2.8, f-4, f-5.6, f-8, f-11, f-22. There are other increments at the beginning of the scale such as f-0.7 and f-1. There are more towards the end of the scale also the f-32 and f-45. However, the scale from about f-1.4 through f-22 are the most commonly used in general photography and film making. Aperture is also know as a "T-Stop" or Transmission stop. This deliniation from "F-Stop" indiacates a more accurate rating of the lens as a T-stop indicates how much light as actually passing through the elements of glass that the lens is made of and not just a calculation based on the diameter of the iris opening at the aperture is adjusted. There are two major contributors to the quality of the Depth of Field that appears in an image whether it is digital or film based. The first most important factor is the Aperture setting. The lower the aperture number, the larger the opening of the aperture will become, allowing more light into the image plane and effectively reducing the depth of field, causing the backgroun of the image to appear 'blurry' or 'soft' when focus is set to the mid-ground or foreground. Power and Distribution (PD) is also referrd to as 'Electrical Distribution', 'Set Power' or sometimes just simply 'Power'. PD consists of the the electrical wiring, the distribution housing boxes (distro box) and the service end/breaker boxes. Power and Distribution set ups vary wildly in naming of equipment and connection terminals between live events, film/TV sets and rental houses regionally and internationally. Pre-planning the power run is a critical step to ensure a smoothly running production.